John D. Beeghly Fellows for the 2016 Fall Semester are: left to right, back row: Gulnara Gumerova, Yana Flider, Megan Guliano, and front row, Rayann Gagliano, Connie Buck, and Samantha Anderson. 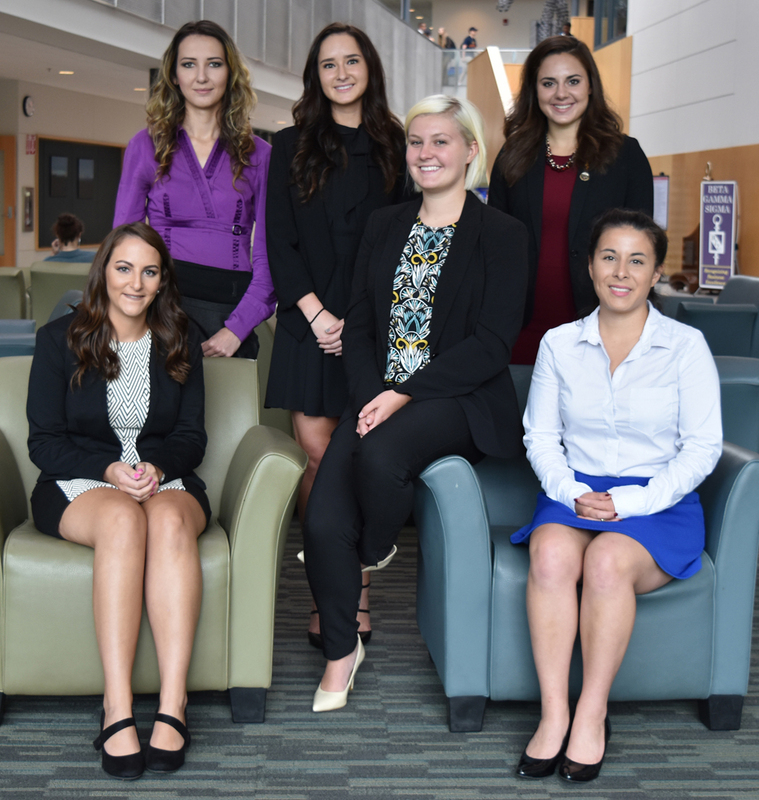 Samantha Anderson, Connie Buck, Yana Flider, Rayann Gagliano, Megan Guliano and Gulnara Gumerova, business students in the Williamson College of Business Administration at Youngstown State University, have been selected as the John D. Beeghly Fellows for the 2016 Fall Semester. The John D. Beeghly Fellows program provides students with a paid fellowship working with the Ohio Small Business Development Center at YSU. Projects include marketing research, preparation of financial statements, export readiness studies, country research, business plan development, cash flow analysis, and sales forecast. Students gain career-related work experience, and are able to position themselves to be competitive in the job market upon graduation. The John D. Beeghly Fellows Program is made possible by an endowment established at the YSU Foundation by Beeghly’s wife and children. Beeghly was a lifelong resident and businessman in Youngstown, and son of area industrialist and philanthropist, Leon A. Beeghly. From 1967 until his death, Beeghly served as vice president and director of Standard Slag Co. and Stancorp, Inc., a holding company for industrial businesses. Samantha Anderson of Poland, Ohio, is a senior Business Economics and Finance major. This is her first semester as a Beeghly Fellow. Anderson completed a Finance internship with Morgan Stanley’s Waypoint Group in Canfield prior to her fellowship. She is a Leslie H. Cochran University Scholar and a student member of the YSU Board of Trustees. Gulnara Gumerova, originally from Tashkent, Uzbekistan, now resides in Struthers, Ohio. She is a senior majoring in Accounting and will graduate in December. This is her first semester as a Beeghly Fellow. She previously was a Peer Tutor at the Center for Student Progress for Accounting courses. Gumerova is a member of Beta Gamma Sigma and the Institute of Management Accountants. Megan Guliano of Warren is a senior Accounting major. She completed an internal auditing internship in the Controller’s Office at YSU, as well as a public audit and tax internship at Cohen & Co. Guliano is a Leslie H. Cochran University Scholar and an active member of Beta Alpha Psi, WCBA Business Leaders, Phi Kappa Phi and Beta Gamma Sigma. She plans to graduate with honors in May of 2017 and return to YSU to earn a Master of Accountancy degree. Upon completion of her graduate studies, she will begin work as a full-time auditor with Cohen & Co. in October of 2018. Rayann Gagliano of New Castle, Pa., is a senior Accounting major graduating in May 2017. This is Gagliano’s first time as an intern with the Small Business Development Center. Prior to her internship, she gained customer service experience along with professional selling and time management skills in the retail industry for four years. Upon graduation, she plans to sit for the CPA exam and begin a career in public accounting. Connie Buck of Negley, Ohio, is a senior Marketing Management major. Buck has also completed two marketing internships with The Pittsburgh Project and Youngstown Neighborhood Development Corporation. She worked for a year as a clerk for Mahoning Country Prosecutor’s office. Currently, she is an export compliance intern at Haltec Corporation in Salem, Ohio. Upon graduation, Buck has accepted an offer at International Justice Mission in Washington D.C.
Yana Flider of Austintown is a senior International Business major, graduating in the Fall 2016. She is originally from Belarus and speaks fluent Russian. Flider was part of the Ohio Export Internship Program and had the opportunity working for Blackwood Pet Food over the summer, where she continues to work as part of an extended internship. Upon graduation she plans to apply for the Mountbatten Institute program, studying towards an MBA and working in London for a year. This is Flider’s second semester as a Beeghly Fellow.